So, you’ve got a great idea for a book. You have a clear picture of the opening scenes and the climactic scene, and maybe some scenes in between, so you jump in and start writing. 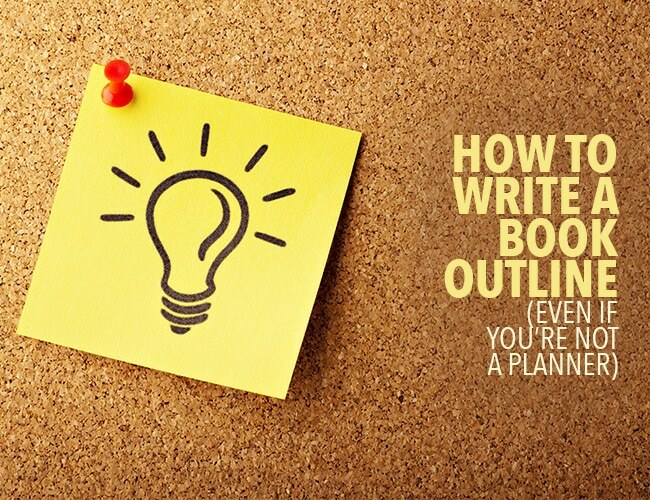 You’re not interested in how to write a book using an outline. But once you’ve knocked out the scenes in your head, the well runs dry, or you find yourself galloping down a series of dead-end roads. If you’ve ever gotten stuck during the writing process, you might feel like you don’t know where to turn. How do you connect the beginning to the end? Is your epic novel idea nothing more than a character sketch, a piece of world-building, or a loosely related set of scenes? Don’t despair! If nothing else, you put in some good practice and laid the groundwork for something more solid. And if you’re wondering how to develop your book into something more solid by using an outline, read on. Outline sounds so English class, doesn’t it? It doesn’t have to be. I prefer to think of an outline as a plan, a structural support for my organically growing story. Like a trellis supports a tomato plant, allowing it to expand, reaching out its tendrils, while providing a basic shape and encouraging the plant to bear fruit. The plan for your story should never be a confining box. It gives you the chance to stretch out and explore even more avenues than you would in forging ahead without a plan. If you’re not convinced, I hope you’ll come to see that an outline can encourage creative freedom, rather than curtail it. Creating an outline may even be my favorite part of the process. To Outline Your Book or Not to Outline Your Book? You’ll hear the debate shouted loudly from both camps. Here’s my belief: story is deeply ingrained in us, and some writers have internalized the elements of story so well, that their outline is automatic and unseen. Doesn’t mean it’s not there — just that it’s become instinctive. Wonderful for them. Most of us, however, should be using a written plan, and there’s no shame in that. I’m proud to be an outliner. Remember the old soup commercial: “So chunky, you’ll be tempted to eat it with a fork, but use a spoon to get every drop.” Can you imagine if you ate soup with a fork? You’d miss a lot of the good stuff. An outline is like a spoon for book writing. The beauty of having an outline is that you can make sure to include all the necessary bits and — even more importantly — you can leave leave out everything that shouldn’t be in there. Let’s go back to the soup analogy. The cook didn’t just throw all the contents of the refrigerator in a pot. Everything in the soup was there for a reason, and your story must be the same. Without a plan, it’s hit and miss. Stories wander off track, leaving loose ends flapping and violating the rules of cause and effect. The essential elements vary according to genre. It’s important to include the conventions and obligatory scenes for the type of story you’re writing because this is what helps you keep your promise to the reader. When you sit down and start tapping at the keyboard, you should realize that writing is communicating, and communication is two-way. It consists of a sender and a receiver. When you send your stories out into the world, please be aware that there are real, live individuals at the other end of your words. When they pick up your book, it is with certain expectations, and if you want your book to be successful — and by that I mean read and enjoyed by people outside your immediate family — you need to meet those expectations. The best resource I know for determining the conventions and obligatory scenes by genre is Shawn Coyne. Read his book, The Story Grid, listen to the podcasts, visit his website. Other necessary bits include cause and effect cycles and the setups that will lead to your payoffs. Anything that’s irrelevant or boring. Period. A major problem with writing sans outline is that there’s a lot of trial and error involved as you try to work out where the story’s going and what’s important. When you eventually get it figured out, it’s downright dispiriting to go back and cut out so many words that you poured your heart into but don’t belong in the story. You begin to rationalize to fit stuff in that really shouldn’t be there. You’ve heard the phrase “kill your darlings.” This is what it’s referring to. And slicing up your baby is difficult and unpleasant. Most of us do a lousy job. What’s more, it can be largely prevented by planning your story before you begin writing. I’ve been teaching piano for twenty years. I’ve had hundreds of students, and when I sit down at the bench with someone new, I need to determine a curriculum that will work best for that student. It’s much the same with stories and outlines. It’s not one size fits all. There are dozens of methods for outlining, and I invite you to explore and discover what works best for you, and for each story you want to write. I’m going to share the two methods that I use most often. But before I do, let’s discuss a few elements you must have a handle on before a coherent outline is possible. Story is always about someone striving toward something. You must have a pretty clear idea what your protagonist wants before you begin the story. Inside and out. In other words, she’ll have an external goal and an internal goal that are often at odds. And to pour on even more conflict, you must know your antagonist’s goals and desires as well, as they will oppose your protagonist’s. I do not advocate writing out detailed sketches for each character. They often do more harm than good because, again, after investing so much time and work into the project, you’re tempted to use the especially clever parts even if they have no place in the story. But there are important things you need to know. In his superb book Voice, The Secret Power of Great Writing, James Scott Bell puts forth these five key questions for developing your character. 1. What is my character’s dominant impression? The great writing teacher Dwight V. Swain put it like this: adjective of manner + noun of vocation. Sloppy waitress. Drunken doctor. Meticulous showgirl. You get the point. 2. What is my character’s physical appearance? You don’t have to take five pages doing this. A paragraph or two will do. 3. What is my character’s basic background? Where did he grow up? Family life and conditions at home? Education level? Anything pertinent to the story. 4. What life-altering event happened to my character at age sixteen? Put a star by this one — it is key. And it doesn’t necessarily have to be age sixteen. Something happened, at some formative point, to change this character’s life and make them think and behave the way they do. Very often, the story is about overcoming the long-reaching effects of that event. 5. What does my character yearn for? Check. We covered that above. And now, without further ado, my two favorite methods for outlining. Hook: A compelling event that opens the story. Backstory: A bridge that introduces us to the main characters, establishes the setting, and preps for the next parts of the story. Trigger: An event that propels your protagonist into the crisis. Crisis: A decision point involving your protagonist’s key emotional dilemma that may include physical perils, as well. Struggle: A series of escalating try/fail cycles as your character works to resolve the dilemma. Epiphany: Your character’s aha! moment, the emotional realization of what’s preventing them from reaching their goal. Plan: Armed with newfound insight, your character formulates a plan of action. Climax: The ultimate confrontation between your protagonist and antagonist. Resolution: The dilemma is resolved and we feel the catharsis and tie up loose ends. This is from The Story Grid, and applies to the story as a whole, as well as each component of the story, such as scene, sequence, and beat. I especially love how it helps shape each scene and ensures everything relevant is included. I use it to plan my overall story and each scene within the story. Inciting Incident: The big event that kicks off the story, upsetting the life balance of your protagonist. On the scene level, it is the event that opens your scene and presents something that needs to be resolved within that scene. Complications: The escalating degrees of conflict the protagonist faces. On a scene level, it’s what stands in the way of the scene’s main character reaching the goal of the scene. Crisis: A dilemma that offers a choice between two options — the best bad choice, or irreconcilable goods. In other words, the character is forced to make a difficult decision. Climax: This is when the character acts on the choice they’ve made. Choices and actions define the character. They may be unable to follow through, change their mind, try to dodge, or stand up and fight. This is the moment of truth. Resolution: The crucial opportunity for the reader to metabolize what’s just happened. On the story level, you wrap up any loose ends and sign off. On the scene level, you take score and ride the impetus into the next scene. There is no one way to do it. Mix and match methods, try different structures. Find what works for you and tailor the process to each individual story. Above all, have fun. This is like being let loose in a room full of Legos and Lincoln Logs, with an endless supply of all the best accessories. Start putting stuff together, build a structure, change it up, tear it down. Ask, what if I did this? Or this? Try it on and see if it fits, without investing days, weeks, or even years into something that doesn’t work. Make a plan, and have a blast! How about you? Are you a pantser or a planner? If you despise outlining, have I convinced you to give it another try? If you love plotting, what’s your favorite method? Let us know in the comments section. Choose the Nine Checkpoints or the Five Commandments, and use it as a springboard for planning a story. Brainstorm different ways to fill in the parts of the plan. Ask yourself what would happen if you changed something about the plan. Try it one way, then try it another way. Stretch your brain. Think outside the box. Above all, have fun. Don’t have a story to plan? Plan a new one based on this prompt: A sassy model ignores her friends’ advice and . . . Spend fifteen minutes practicing. When you’re finished, post what you came up with in the comments section. And if you post, please provide feedback for your fellow planners! The post How to Write a Book Using an Outline appeared first on The Write Practice.